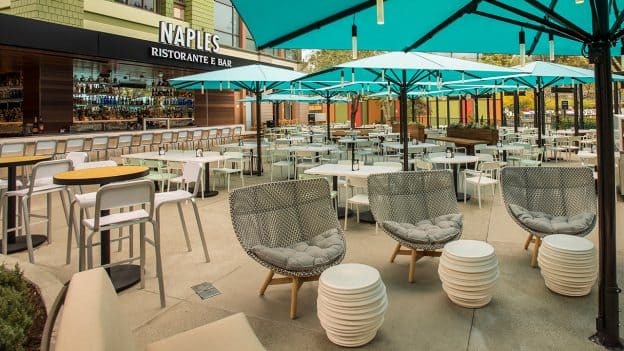 If you’ve been to the Downtown Disney District at the Disneyland Resort recently, you may have noticed the Naples Ristorante e Pizzeria has been undergoing some exciting changes – and we’re happy to announce that the first phase of these renovations is complete! Located on the ground level, a new modern patio offers guests a place to sit back, relax, and enjoy a delicious dish or beverage on a warm summer day. The patio has a new outside bar, as well as additional seating for al fresco dining and is just steps away from the theme park esplanade. 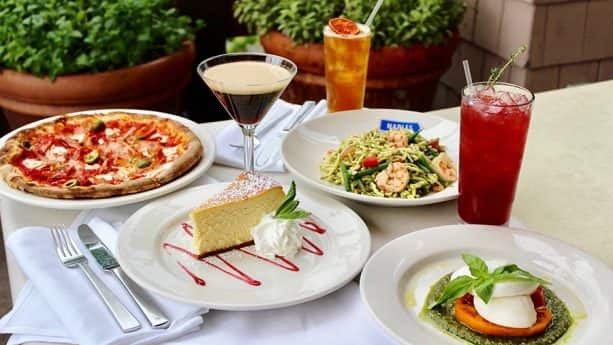 In addition, this classic Neapolitan eatery has also recently added some tasty new items to the menu just in time for summer! 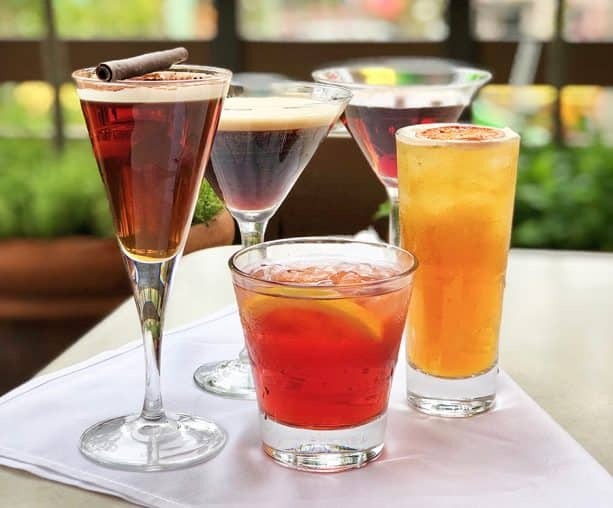 New additions include Trofie, Gnocchetti, Barramundi Alla Livornese, five new gourmet pizzas, and some new, delightfully refreshing mocktails. Joining an array of delicious pastas, the Trofie and Gnocchetti are dishes that will delight your taste buds. The Trofie comes with twisted pasta, shrimp, basil pesto, green beans, and fresh tomatoes; while the Gnoccheti consists of hand-made potato dumplings, fresh tomatoes, garlic, basil, and Parmesan cheese. You can also enjoy a taste of the Mediterranean Sea with the Barramundi Alla Livornese. This sea bass dish comes with spinach, tomato, capers, olives, garlic, onions, and chili flakes. Using Caputo flour imported from Naples, you’ll find several new pizzas on the menu, all featuring gourmet toppings and authentic Italian flavors. If you’re looking for vegetarian options, the Marinara e Capperi or the Melanzane pizzas are the way to go. Both are made with tomato sauce and topped with fresh, vegetarian ingredients. The Marinara e Capperi is topped with capers, garlic, and oregano, and the Melanzane is topped with mozzarella, fried eggplant, and basil. For a little more protein, there are two pizzas made with tomato sauce and ham. 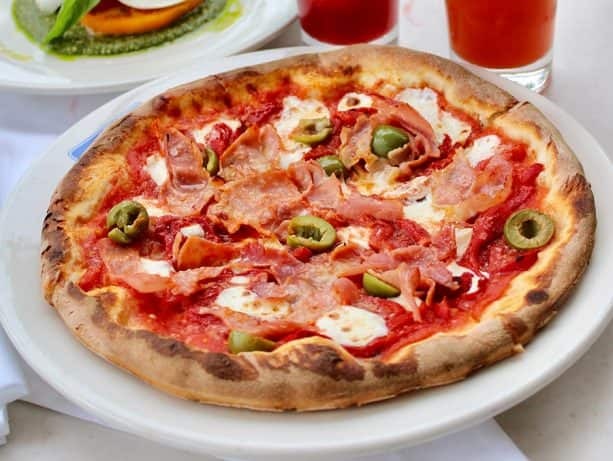 The Porchetta pizza is made topped with Porchetta ham and mozzarella, and the Capricciosa is topped with mozzarella, roasted red peppers, Parma ham, and green olives. There’s also a Pesto e Gamberi pizza made with pesto sauce and topped with mozzarella, shrimp, and fresh tomatoes. Of course, a warm meal just isn’t complete without a refreshing beverage. Naples has a few new non-alcoholic mocktails to the menu like the The Lunch Punch consists of lemon juice, pomegranate juice, and apple juice; the Capri Holiday includes orange juice, lemonade, blood orange syrup and amaretto syrup, and the signature Naples Blush has pomegranate juice, blood orange juice, lemon juice, and sparkling soda. But that’s not all! There’s even more in store for this modern southern Italy-inspired eatery. Set to be completed later this year are renovations to the upstairs outdoor area and interior space. The restaurant will have a modern, European feel featuring clean lines and bold Italian-inspired patterns. 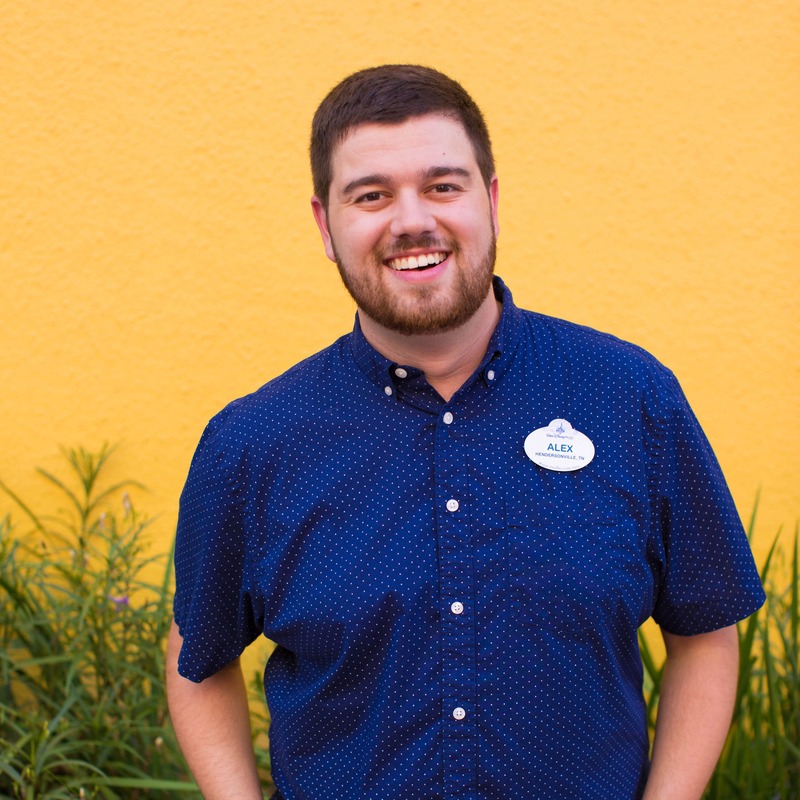 This refurbishment is a part of the larger, promenade-wide transformation at Downtown Disney with multiple new venues and refurbishments other dining and retail locations. 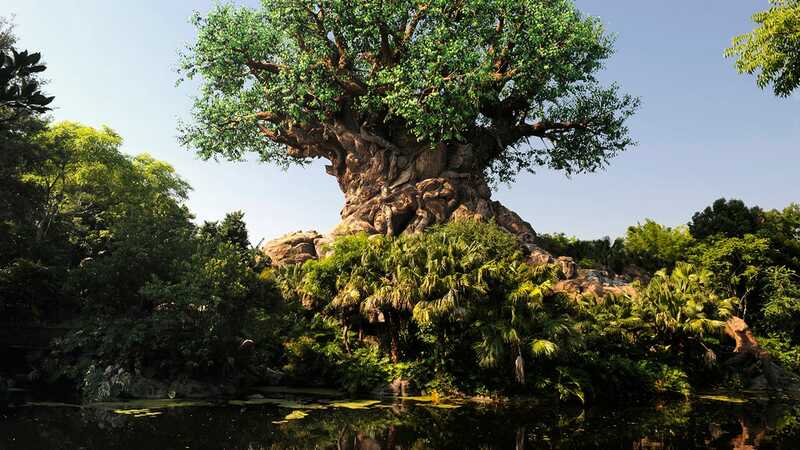 While these renovations are underway, Downtown Disney remains open to guests and a hot spot for hanging out with friends and family. 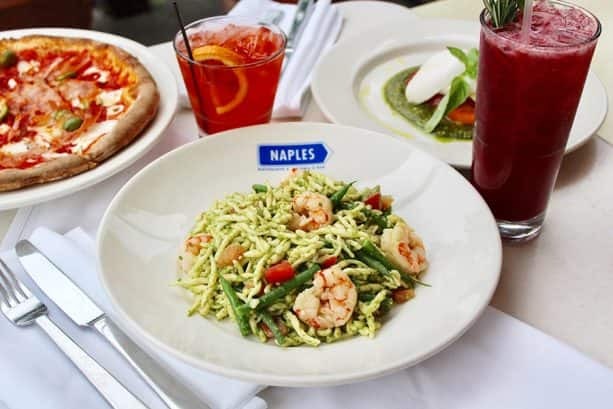 To make reservations for Naples Ristorante e Pizzeria and to see the full (and delicious!) menu, visit the Disneyland Resort website or call (714) 781-DINE (714 781-3463) between 7 a.m. and 9 p.m. daily Pacific Time. The new patio area looks wonderful. Love the lighting under the umbrellas. Anyone know who makes them?